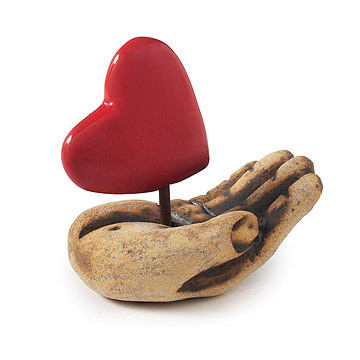 This stoneware sculpture represents the willingness to give and receive love, and the need to protect it. Carved by hand from stoneware, this sculpture represents the willingness to give and receive love, as well as the need to protect it. Lovingly made by hand, each piece bears one-of-a-kind details, much like the loved ones in our own lives. The intricate folds and lines in the hand and fingers are added after the clay is firm to give the hand a distinctive and realistic feel. Since each sculpture is individually carved, no two pieces are alike. Handmade in Kansas City. Cathy Broski's work is steeped in archetypal and personal symbolism. "Figures, houses, boats and pottery are all vessels to contain things we hold dear, and sometimes those things we would cast off. I chose these forms to work with because they have several levels of meaning I find intriguing to explore," she says. Each of her pieces begins as a slab of clay that is thrown on the potter's wheel then hand-carved. Once the first firing is complete, she applies and wipes off a combination of terra sigilattas, slips, stains, and glazes, then fires it again. This process is repeated until she achieves the desired effect, in which the eye is compelled to explore the entire surface of the piece. Just perfect ,I will buy again for my next wedding gift,! Beautiful, love the symbolism. Small and perfect. Sits in my office, makes me smile every time I see it. Beautifully detailed. After 37 years of marriage this item was a wonderful visual expression of our lasting love. Highly recommend this item. I love the detail of the item. Birthday gift for my sister, just the right size for her mantle and a perfect pop of color! I love it and put on a book shelf next to a picture of a much loved pet that we no longer have. It looks great. Should have been called "I give you my heart"
Great concept, but it should be maybe 50% larger. Comes across more like a paperweight than an objet d'art. Beautiful piece that warms our home.